Iraqi militants released three Turkish hostages Tuesday, shortly after another group of kidnappers claimed to have executed an American soldier captured nearly three months ago. The killing of Spc. 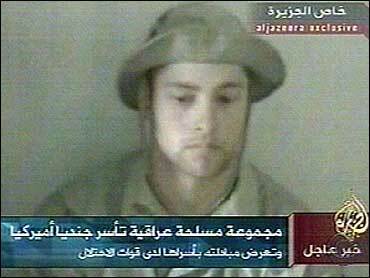 Keith M. Maupin, 20, of Batavia, Ohio, was reported by Arab television, which aired a videotape showing a blindfolded man identified by his captors as Maupin sitting on the ground. Al-Jazeera said that in the next scene, gunmen shoot the man in the back of the head, in front of a hole dug in the ground. The station did not broadcast the killing. No body has been found and the Army says it has no confirmation of Maupin's death. He continues to be officially listed as captured, reports CBS National Security Correspondent David Martin. The military said it could not immediately confirm whether the man shown in the murky videotape was indeed Maupin. Maj. Willie Harris, spokesman for the Army's 88th Regional Readiness Command, said the videotape is being analyzed by the Defense Department. Meanwhile, the father of a U.S. Marine who was reported kidnapped by militants issued a plea Monday for his release. The captors of Cpl. Wassef Ali Hassoun have threatened to behead him. The three Turks also were threatened with beheading in the next two days. But the Turkish government said Tuesday the three had been freed. The Arab satellite station broadcast a videotape showing the three Turkish hostages, believed to be contractors, kneeling in front of three militants as one read a statement. "For the sake of you, our brothers, and Muslims of the people of Turkey … we will release these hostages and send them safely home," the statement said. Al-Jazeera said Maupin's captors issued a statement along with their video calling themselves "The Sharp Sword against the Enemies of God and His Prophet." The militants said they killed the soldier because the United States did not change its policies in Iraq and to avenge "martyrs" in Iraq, Saudi Arabia and Algeria. Maupin was among nine Americans, seven of them contractors, who disappeared after an ambush on a convoy west of Baghdad on April 9. The bodies of four civilian employees of Kellogg Brown & Root were later found in a shallow grave near the site of the attack. The body of Sgt. Elmer Krause, of Greensboro, N.C., was later found. One civilian driver, Thomas Hamill of Macon, Miss., was kidnapped but escaped from his captors nearly a month later. The others are missing. showing him sitting on the ground in front of armed militants. There had been no word on his fate since. In Maupin's hometown, about 200 people held a vigil in a driving rain early Monday night. Yellow ribbons, flowers, messages of support and a poster of Maupin in uniform have been fastened to a chain-link fence surrounding school buses at Glen Este High School, where Maupin graduated in 2001. Maupin's abduction came amid a wave of kidnappings in which dozens of foreigners were snatched. Most were later freed, though an Italian and a Lebanese man were killed. More recently, the kidnappings have taken a more grisly turn with the kidnapping and subsequent beheadings of Berg and the South Korean. Hassoun, an American Marine of Lebanese descent, was shown blindfolded, with a sword brandished over his head in a videotape aired Sunday on Al-Jazeera. The militants threatened to behead him unless all Iraqis "in occupation jails" are freed. They did not set a timeframe. "I appeal to the kidnappers and to their conscience and faith to release my son," his father, Ali Hassoun, said in an interview with The Associated Press at his house in the northern Lebanese port city of Tripoli. "He is not a fighter. I hope that they will respond favorably to my appeal. May God reward them," he said. The U.S. military said Hassoun, 24, was last seen June 19 and did not report for duty the next day. Hassoun had gone "on an unauthorized absence," said Brig. Gen. Mark Kimmitt, the coalition deputy operations chief in Baghdad, giving few details. Other kidnappers have threatened to behead Pakistani driver, Amjad Hafeez, by Wednesday. The Turkish news agency Ilhas reported Monday that two other Turks missing since June 1 have been kidnapped, producing photos of the men in custody.